WHAT IS AMIGHTYWIND MINISTRY ALL ABOUT? YOU CANNOT TALK ABOUT THE END TIME PROPHETIC WITHOUT MENTIONING AMIGHTYWIND MINISTRY unless, you have not yet heard of the MINISTRY or have decided to disregard it for some reason (for example, as a result of the false rumours going around that it is a false prophetic ministry). AMIGHTYWIND MINISTRY IS NOT AND HAS NEVER BEEN A FALSE PROPHETIC MINISTRY!!! There are many good fruits from it plus so much proof of the holy prophecies. AMIGHTYWIND MINISTRY is a MINISTRY started by YAH (a.k.a GOD in Hebrew) as a LAST CHANCE END TIME MINISTRY that preaches YAH’S HOLINESS like no other. There are many GOOD TESTIMONIES from this MINISTRY. There are also many rewards (HEAVENLY) awaiting those who support the MINISTRY in any way. YAH has made it clear that without this MINISTRY (Amightywind Ministry), which also a Temple without walls, Nobody, will be able to make it back to HEAVEN particularly in these perilous end times. This why YAH raised up this MINISTRY, so that as many as whose names were written in the LAMB’S Book of Life from (before) the foundations of the earth would return to the HEAVENS to dwell there with the HEAVENLY FATHER, HEAVENLY MOTHER and HEAVENLY BROTHER/BRIDEGROOM. Whoever loves Amightywind Ministry will enjoy it’s fruits (blessings and rewards). We are warned by YAH not to speak against this MINISTRY because when one does, they touch the APPLE OF YAH’S EYE and will end up damning their souls for eternity, that is to say lose their place in HEAVEN and end up in Hell, the Lake of Fire. 15 Yahweh Elohim of their ancestors repeatedly sent messages through his messengers because he wanted to spare his people and his dwelling place. 16 But they mocked Elohim’s messengers, despised his words, and made fun of his prophets until Yahweh became angry with his people. He could no longer heal them. 17 So he had the Babylonian king attack them and execute their best young men in their holy temple. He didn’t spare the best men or the unmarried women, the old people or the sick people. Yahweh handed all of them over to him. YAH (a.k.a GOD) has called my wife and I into MINISTRY. We praise YAH for that. In this MINISTRY, we will often mention AMIGHTYWIND MINISTRY because you can’t talk about END TIME PROPHETIC and most especially BIBLE PROPHECY without mentioning AMIGHTYWIND MINISTRY. You just can’t! There is a reason for that. Click here for more. HAVE YOU EVER WONDERED WHO THE ELIJAH is that YAHUVEH (a.k.a YAHWEH) talks about in Malachi 3 and 4 is? Note that the ELIJAH mentioned in the book of Malachi is totally different from the TWO WITNESSES. One of the TWO WITNESSES will be the “LAST ELIJAH” before most terrible part of the GREAT TRIBULATION. YAH has revealed so many secrets through AMIGHTYWIND MINISTRY in these End Times, secrets that nobody can research anywhere and find them. Only YAH can reveal them as HE wills. Who are they (AMIGHTYWIND MINISTRY briefly)? AMIGHTYWIND MINISTRY is YAH’S Prophetic End Time Last Chance Ministry set up to help YAH’S CHILDREN make HEAVEN as well as get through these Perilous Last Days. Click on the image to watch the video in which Apostle / Prophet Ezra give his TESTIMONY,.. The following video is a MEMORIAL OF THE MINISTRY FROM THE BEGNNING. Apostle/Prophet Elisheva Eliyahu is playing exactly the same role as did PROPHET ELIJAH OF OLD and JOHN THE BAPTIST! She is NOT re-incarnated in any way. She is a unique individual created by YAH to play a similar role in this generation (the last generation on the earth) just like Deborah, the First Woman Leader / Prophet in the Land Of Israel (Book of Judges). She is a BRIDE OF YAHUSHUA as well as YAHUSHUA’S Head Administrator. Her role is to show the WAY OF YAHUVEH (a.k.a YAHWEH) as it is meant to be. She is speaking out to the GENTILES, CHRISTIANS / MESSIANIC JEWS and the ORTHODOX JEWS. 4 “Remember the teachings of my servant Moses, the rules and regulations that I gave to him at Horeb for all Israel. 3 “I’m going to send my messenger, and he will clear the way ahead of me. Then the Adonay you are looking for will suddenly come to his temple. The messenger of the promise[a] will come. He is the one you want,” says Yahweh Tsebaoth. 2 But who will be able to endure the day he comes? Who will be able to survive on the day he appears? He is like a purifying fire and like a cleansing soap. 3 He will act like a refiner and a purifier of silver. He will purify Levi’s sons and refine them like gold and silver. Then they will bring acceptable offerings to Yahweh. 4 The offerings from Judah and Jerusalem will be pleasing to Yahweh as in the past, as in years long ago. 5 “I will come to judge you. I will be quick to testify against sorcerers, adulterers, lying witnesses, and those who cheat workers out of their wages and oppress widows and orphans. I will also testify against those who deprive foreigners of their rights. None of them fear me,” says Yahweh Tsebaoth. YAH somehow led us to AMIGHTYWIND MINISTRY in 2015. Ever since then our way of understanding and relating with YAH and HIS WORD has changed enormously. We can not stop praising YAH for this. AMIGHTYWIND MINISTRY is truly a blessing for us in these perilous end times. 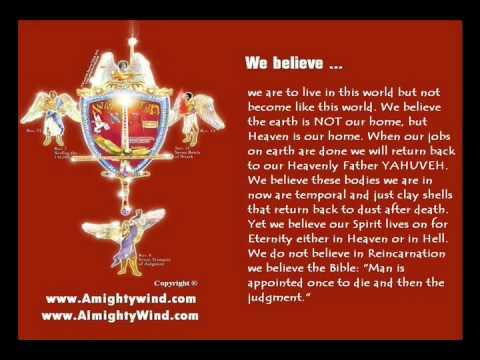 Every true child of YAH should be following and SUPPORTING THE MINISTRY if they really want to make HEAVEN! Some people have a problem with the fact that a woman is the main leadership of the MINISTRY. They use the TORAH to defend their arguments. Let us remember DEBORAH, whom YAH called to be A JUDGE OF THE ISRAELITES as seen in the Book of Judges. Last I remember, she was a woman. Jeremiah 18 tells us that YAH is the PORTER and we human beings are the CLAY. HE can choose to mould us in which ever way HE pleases. Our job is to dig deeper in PRAYER to know more and settle things/issues of concern with YAH. Also click here for more on THE SECRETS OF THE HOLY SPIRIT (a.k.a RUACH HA KODESH). As of August 2017, YAH has released 138 PROPHECIES altogether through AMIGHTYWIND MINISTRY. We are to read them alongside YAH’S WORD not just once but constantly, weekly because we human beings, we are very forgetful. We need constant reminders. 4 Don’t Despair When You Can’t Feel Me By Your Side! 5 You Are My Hidden Treasure, You Are My Hidden…! 6 First I Weep, Then I’m Angry! 15 It’s One Minute Until Midnight – YAHUSHUA Comes In The…! 16 Don’t Muzzle MY Prophets! 20 Beware Of The Horror Of New Boiling Black Blood Plague…! 22 Beloved, Don’t Become Your Own Worst Enemies! 24 Part 1- Beware The Ark Door And The Book Of The Gentiles…! 24 Part 2 – Beware Of The Yeast Of The Pharisees! 27 YAHUSHUA Will Return On A Sabbath, Arise Women…! 29 Woe Be Unto The Wolves In Sheep’s Clothing! 30 Beware I Will Do What You Think Not, At A Time You Think…! 36 I Am Not Only Your God Of Yesterday, Today, But Tomorrow…! 40 Don’t Be Part of the Counterfeit Bride! 43 Part 1- “I AM” God The Potter, You Are MY Clay! 46 Warn The Enemies Once…! 50 Hear Oh Yisrael! THE POWER! THE POWER! THE…! 54 Now Is The Time! Stay Focused, Obey Your General…! 58 America, Repent or Perish, Before It’s Too Late! 61 Where Are All My Holy Men, That Lift Up Their Holy Hands…! 66 Blow The Trumpet and Warn, YAHUSHUA Is Not Coming For…! 70 What Will YAHUVEH Do When Calamity Comes Knocking At…? 76 Beloved Bride of YAHUSHUA, Arise and Prepare Yourself…! 85 Shout It From The Housetops, Shout It To The World,…! 87 Israel, O Israel, Hear O Israel, Jerusalem And The Rest Of The…! 92 Be Of Good Cheer For I, YAHUSHUA HA MASHIACH…! 93 2008 Will be a War Like None Other Against the False Prophets…! 94 I, YAHUVEH, Say, Do Not Underestimate MY Anger…! 101 I, YAHUVEH, Say, “Your Actions Speak Louder Than Your…! 105 I, YAHUVEH, Say, In 2009 I’m Going To Shake Everything That..! 113 Thus Saith YAHUSHUA ha MASHIACH, Will You Allow ME…! 115 Beware Of The Totalitarian Dictatorship Coming To America And …! 120 Don’t Give Up! Do Not Quit! 121 Is YAHUSHUA just Savior or Is HE LORD GOD ALMIGHTY….? 122 “You Can’t Tear Down the Gates of Heaven” thus saith YAHUSHUA! 125 Satan’s elite will use the blood red moon of September 27th, 2015! 126 GOD’S Wrath to this World is About to be Sent!